Nickname Gilo, Skinny, Splash, "King of Spain", "The Wheelie Bin"
Ashley Fraser Giles MBE (born 19 March 1973) is an English retired cricketer. Giles played the entirety of his 14-year first-class career at Warwickshire County Cricket Club. He played 54 Test matches and 62 One Day Internationals for England before being forced to retire due to a recurring hip injury. Giles started his career as a fast bowler before an early injury forced him to become a slow left-arm spinner. He made his first-class debut for Warwickshire in 1993, but it was 1996 when he gained a regular place in the side, winning the NBC Denis Compton Award for being The Most Promising Young Player at the club. Giles was awarded his One Day International debut against Australia in May 1997, and 36 wickets in the 1998 season led to his first Test match against South Africa, although it would be a further two years before he would play another Test for England. He did not have the most fluent bowling action and was unable to turn the ball a huge amount, although at 6 feet 4 inches (2 m), he was able to use his height to extract plenty of bounce. As a right-handed batsman, Giles scored three first-class centuries, but his highest international score was only 59, an innings that helped England win The Ashes in 2005. Between November 2000 and the emergence of Monty Panesar in 2006 (during his first prolonged injury lay-off), Giles was Englands first-choice spin bowler, although he was constantly having to justify his selection. This came to a head in 2004 when Giles considered retirement before a match-winning 9-wicket haul against the West Indies gave him the confidence to perform at the highest level. 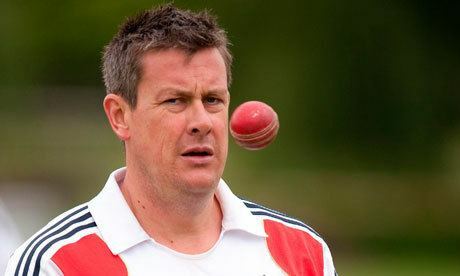 Ashley Giles spent his early years living in Woking, attending the Kingfield First and Middle Schools. Giles benefited from a cricket-loving teacher, and became involved with District and County Cricket at Under-9 level. After his parents moved to Ripley, Surrey, he attended the George Abbot School in Guildford, completing his GCSEs and A-levels. The Giles family was heavily involved with Ripley Cricket Club: Ashleys father, brother Andrew, cousins and uncles all played for the club, as did both paternal and maternal grandfathers previously. Giles soon moved into the Saturday 2nd XI, opening the bowling with close friend Ian Ward. At this stage, both players were aspiring fast bowlers, and a deadly force for Surrey Under-9s. Giles moved to Guildford Cricket Club, working under coach Brian Ruby alongside future professionals Darren and Martin Bicknell. Giles advanced through the county age-groups, and toured Barbados with Surrey Young Cricketers in 1990/01. While at Guildford, an injury forced Giles to try bowling spin, which brought him some success. Giles made his debut for the Surrey Second XI in 1990, and was named Surrey Young Cricketer of the Year in 1991. The following season, he played one further match for Surrey but they were unable to offer him a professional contract. After an initial trial with Dennis Amiss, Giles was awarded a one-year contract Warwickshire County Cricket Club. Between 1992 and 1995, Giles played the majority of his games for Warwickshire Second XI, scoring over 2,500 runs and taking 165 wickets in this period. He made his first-class debut for Warwickshire against Kent in May 1993; his second match was against Durham later that season. In September 1993, he made his List A debut against the touring Zimbabweans, his first wicket being that of Grant Flower, although it would not be until the tail-end of the 1995 season before Giles began to cement his place in the Warwickshire side taking 16 wickets at an average of 22.12 (in 6 matches). 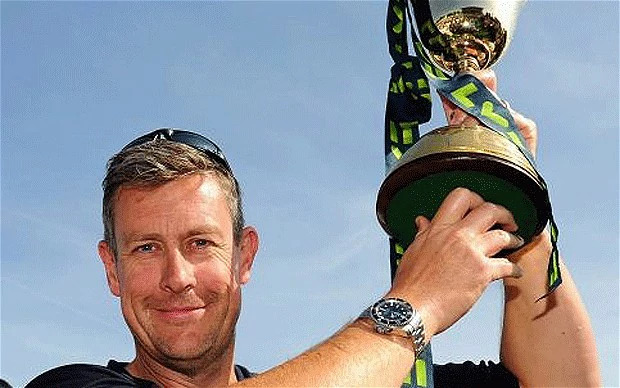 In 1996 Giles won the NBC Denis Compton Award, and before his debut for the full national side in 1998 he toured Australia, Sri Lanka and Kenya with the England A team. In February 2006, a recurring hip injury forced Giles out of both the Test and ODI sections of Englands tour to India that year. His number 8 spot was taken first by left-arm spinner Ian Blackwell and then fast bowler Liam Plunkett, and Giles admitted that left-arm spinner Monty Panesar was another threat to his place. In the final Test, veteran off-break bowler Shaun Udal replaced him, with some success. In the Tests of summer 2006, whilst Giles was injured for the entire season, Panesar played against both Sri Lanka and Pakistan, with conspicuous success. On 24 April 2006, Giles gave an interview stating that although he had at one point feared his career might be in danger, he was now "a lot more confident and happy" after being diagnosed with a sportmans hernia. At the end of October 2006, after spending time in India with the England Champions Trophy squad, Giles was passed fit for selection, and took Panesars place in the team for the first Test at Brisbane. However, he was dropped for the third Test in the series, with Panesar reclaiming his place. Giles is a resident of Droitwich Spa, Worcestershire and was named an Honorary Citizen of the town by the Mayor after the 2005 Ashes success. The award was created for him, as he did not meet the usual criteria to become a Freeman. Giles was awarded an MBE in the 2006 New Year Honours for his role in the successful Ashes-winning squad. He is married to the Norwegian Stine (née Osland), with whom he has two children, Anders Fraser and Matilde. He is a lifelong supporter of Queens Park Rangers F.C..